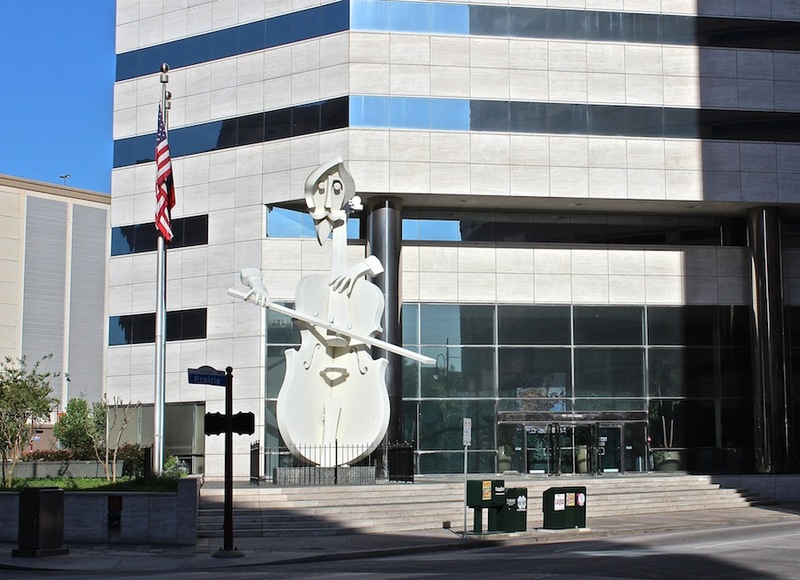 Take a close look at the disembodied hands and head of Virtuoso, David Adickes’ cellist sculpture permanently poised in mid-song on the eastern corner of Smith and Prairie streets adjacent to the Theater District in Downtown. Virtuoso has the distinction of being the first larger-than-life sculpture to emerge from the hands of artist and sculptor David Adickes. In the early 1980s, he created the 36-foot tall, 21-ton sculpture on a commission from the developer of Lyric Centre, the office building behind it. Developer Joe Russo asked for a piece of public art that paid homage to music, dance and performing arts, making it a fitting neighbor for the adjacent Theater District. 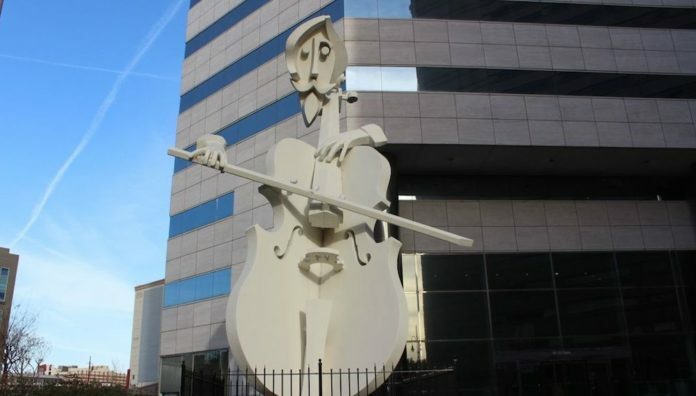 The completed abstract sculpture depicts a giant cello, being played by mustachioed and goateed player, who is completely invisible except for his head, hands and bow. 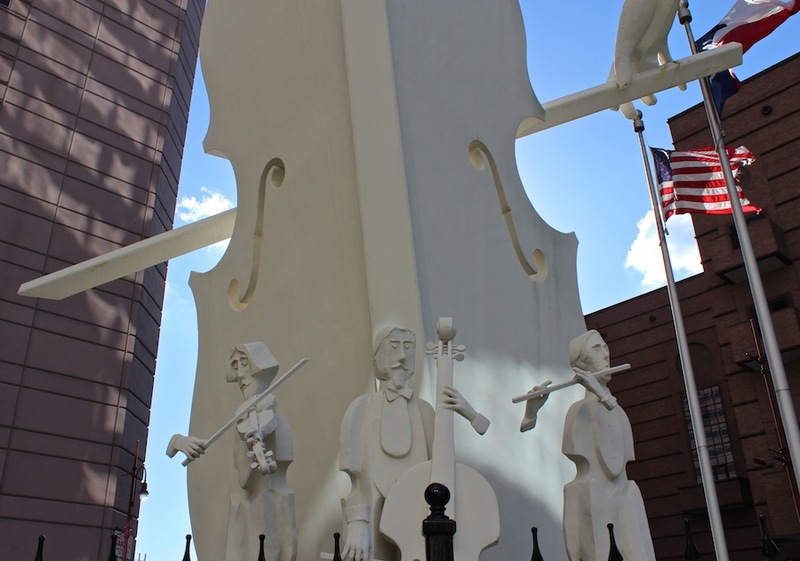 Behind the cello are a trio of abstract orchestra members, on a more life-size scale, playing a violin, upright bass and a flute. Their bodies reminiscent of string instruments, their hands are attached to seemingly invisible arms. If you stand close enough, and traffic is quiet, you can hear a classical soundtrack playing at the sculpture. Virtuoso was polarizing when it first debuted in 1983, with critics and many residents panning Adickes’ work. 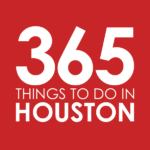 But the work proved popular amongst many Houstonians and over the years most critics have accepted and embraced it as a piece of pop art that’s at home in Houston. Of course, Adickes went on to create other giant pieces in his workshop including 36-foot abstract statues of The Beatles in the Sergeant Pepper’s Lonely Hearts Club Band finery, the realistic 18-foot busts of U.S. and Texas presidents, the 67-foot Sam Houston Statue along I-45 in Huntsville, and the “We Love Houston” sign, most recently installed along the Katy Freeway in the Heights. Parking: There’s no dedicated parking to view Virtuoso, unless you want to pay for the Lyric Centre’s parking. However, you can usually find metered parking on the surrounding blocks. Parking is $2 per hour Monday through Saturday from 8am to 6pm. There is no metered charge most nights and Sundays.